Tis the season for sweets. If you don't want to feel left out of the festivities but want to keep up with your diet, this alternative to a classic recipe is just what you need! 11. In medium sauce pan, combine sugar and cornstarch substitute. 22. Add half and half and egg yolks and whisk until well combined. Bring to boil over medium heat, stirring constantly. Boil 1 minute and remove from heat. Stir in butter, coconut and vanilla. 33. Pour into medium bowl, cover with saran wrap directly on the filling itself to avoiding a sticky film on top. Let sit for 30 minutes. 44. Spoon coconut mixture into pie crust and careful speed to evenly distribute. Cover and refrigerate for 30 minutes or until set. 72. 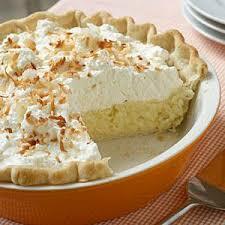 Spread evenly over pie and sprinkle the top with toasted coconut.